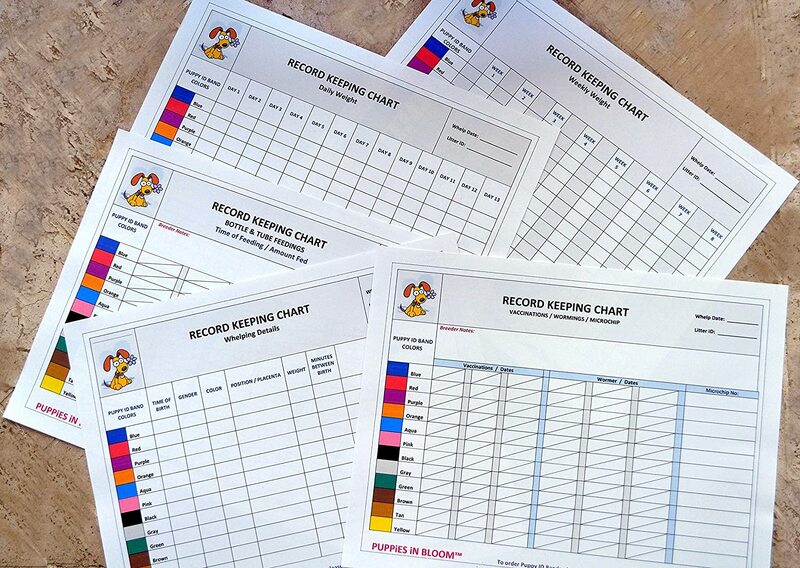 Record Keeping Charts for Breeders - Free Shipping! 4 Charts - 1 Master Print of each - Make your own copies! Record Keeping Charts by PUPPiES iN BLOOMTM are designed to use with our Puppy ID Bands as shown in the pictures. (Puppy ID Bands are sold separately and NOT included with the charts.) The charts and puppy bands are color coordinated with each other so the breeder can easily log records of each puppy according to the color of his collar. Keeping records has never been easier. 1 SET of 4 Master Charts - Make your own copies and save the Master prints to use over and over again. Share with your friends. Keep detailed records on whelping, feeding times and weight gain.